About the origins of relativity theory and more precisely on the « principle of relativity », I give here the English translation of the Notice nécrologique de Mascart, written by Paul Langevin as successor of Mascart at the chair of Physique générale et expérimentale of the Collège de France. The two papers of Mascart of 1872 and 1874 are known by the historians of sciences, but their historical importance, up to now, was mainly known by French physicists only. 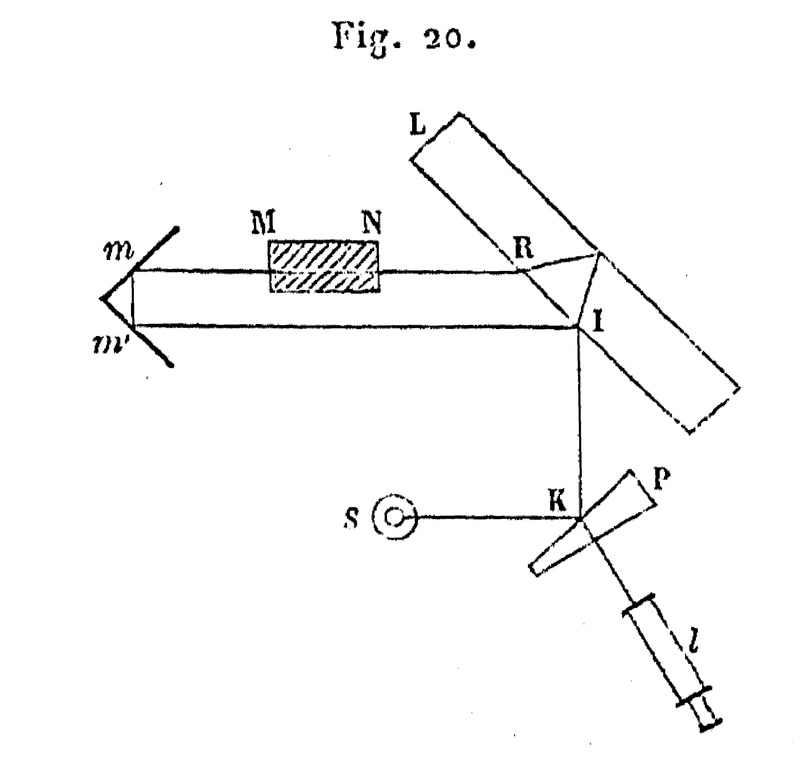 Mascart’s most important work in optics – which showed the best of his theoretical talents, the clarity of his mind, as well as his skill as an experimentalist and his immense experience in the delicate measurements required in optics – is his series of studies on the influence of the earth’s movement on optical phenomena, undertaken in response to a question posed by the Académie des Sciences in 1870 for the Grand Prize in Mathematical Sciences, “Sur les modifications qu’éprouve la lumière par suite du mouvement de la source lumineuse et du mouvement de l’observateur” (“On the changes experienced by light resulting from the movement of its source and the movement of the observer”). 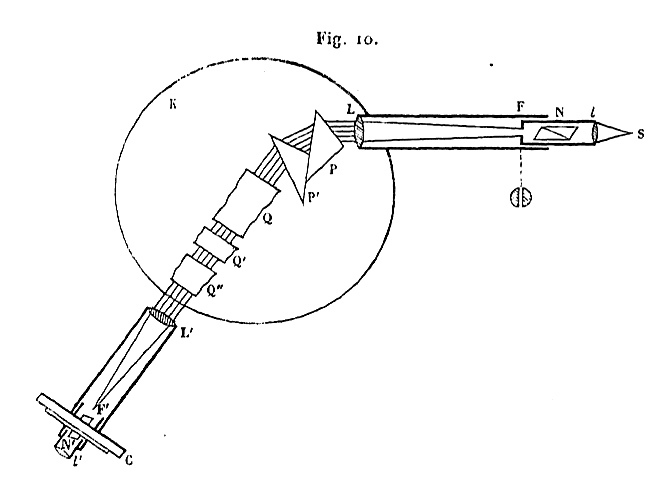 The problem had been raised by Arago in his search for any means of experimentally testing the two opposing theories of light: particles or waves. Arago had noted that if one observes two stars positioned so that the earth moves towards one and away from the other by virtue of its own motion, the apparent refraction seen in a prism of light from these two stars is exactly the same. This result seemed irreconcilable with the particle theory, since light particles coming from the star that the earth is moving away from move more slowly than those from the other star. Fresnel tried to reconcile this with the wave theory by assuming that a refractive medium in motion carries with it only part of the ether it contains. This assumption, together with others on the way that waves are propagated, led him to the result that, in a moving medium, the speed of propagation of waves in the direction of motion of the medium is increased by u ( 1 – 1/n2), where u denotes the speed of the medium, and n its refractive index. If U is the speed of light in a medium at rest, its speed of propagation in the moving medium would then be U + u ( 1 – 1/n2). This formula agreed with Arago’s observations, and Fizeau has shown directly that light waves are driven in part, in accordance with Fresnel’s formula, by the motion of the medium in which they propagate. The question was, however, far from being completely resolved by that, and Mascart showed that new difficulties arose when one looked more closely. Firstly, Arago’s observation was not as simple as it seemed: Mascart noted, by the Doppler principle, that if the two stars emitted the same light, the wavelength of the light hitting the earth would not be the same in the two cases: in a given interval one would receive more waves from the star the earth is heading toward than from the other star. Mascart concluded that, if Arago’s observations were correct, a refractive difference should be observed if one replaced the two stars by two sources based on earth, or, equivalently, that one should perceive a change in deviation working with a terrestrial source whose rays propagate alternately with, or opposite to, the direction of the earth’s motion. An experiment using only earthbound devices would thus provide evidence of the movement of the earth. Mascart made extremely precise observations, following from midday to midnight the refraction of a ray of light in a prism. He sought to discover if the rotation of the earth, by reversing the direction of light rays relative to the movement of the earth, would bring about any change in the deviation produced by the prism. After multiple attempts, he reached a negative conclusion. The phenomena observed are absolutely independent of the translation movement, and the primitive result observed by Arago could not be completely accurate. This led to the question of whether or not the negative result applies to all optical experiments using earthbound apparatus. Mascart considered all such experiments, one by one: diffraction networks, double refraction in Iceland spar, rotation of the plane of polarization by quartz, various interference phenomena. He approached each with extreme precision, the differences sought being extremely small, but in every case the result was absolutely negative. He closes his memoirs on the subject with the words “The general conclusion of this memoir would be that the translational movement of the earth has no appreciable influence on optical phenomena produced from a terrestrial source or solar light, that these phenomena do not give any means of measuring the absolute motion of a body, and that relative movements are the only ones we can measure.” (« Sur les modifications qu’éprouve la lumière par suite du mouvement de la source lumineuse et du mouvement de l’observateur » Annales scientifiques de l’É.N.S. 2e série, tome 1 (1872), p. 157-214 et tome 3 (1874), p. 363-420). For this remarkable body of work Mascart was awarded the Grand Prize in Mathematical Sciences in 1874, and then the Lacaze prize in 1875. The statement of the principle of relativity was in some sense the culmination and coronation of the first part of Mascart’s scientific life which began in 1851, on his graduation from the École Normale, and was filled with purely speculative research, without care for practical applications, devoted almost entirely to optics. The complete obituary notice is available in French. R. Mossery Léon Brillouin, Belin 1999, Pages 11-30.